You've all heard Jimmy Buffet's song, One Particular Harbor?? Well Winterlude is anchored behind "No Particular Cut", which has to be one of the wildest anchorages we've had in our two years of cruising the Northwest Caribbean! Courtesy of Hurricane Hattie in 1956, the caye that used to exist is no more, so we find ourselves anchored directly behind the reef in a brilliant white sand patch. The reef lies only a few boatlengths directly ahead & the surf sounds exactly like lying in bed in my brother Jeff's condo on Gulf Shores with the sliding doors open & hearing the waves breaking on the sand. Between the boat & the breaking reef is every hue of blue, aqua, turquoise and green in the color spectrum. Immediately behind us is a sandbore with scattered coral heads, lots of fish & maybe some conch, available for the catching. Beyond the sandbore, there's nothing but sparkling aqua to deep blue water as far as, the eye can see, blending at the horizon into the mountains of the mainland. Photos don't begin to do it justice, but I tried! The two boats we're sailing with are BIG spearfishing-sailors and as you may know, fishermen are not fond of revealing their best fishing spots. Checking into the NW Caribbean Net this morning, our location was revealed as "No Particular Cut", a takeoff on Jimmy Buffet's "One Particular Harbor"! Watching a falling star careen through the night sky was easy this night -- anchored directly behind this reef, both of us were up every half hour checking the anchor -- didn't make for a restful night, but the were stars even clearer than on most of our overnight sails. There's something about anchoring behind a reef that makes it scarier than being anchored behind a caye, which, if you think about it, makes absolutely no sense. Anchored in 15 feet of water, our Spade anchor is buried with miles behind us in case we drag. The reef knocks down the wave action, just like a caye. Flat coral Belize cayes don't block much wind, so there's no physical difference between the reef or the caye for the boat & the anchor ... it's just the CREW that freaks out! :) But it is spectacular!!! Fishing "No Particular Cut" meant spearfishing/snorkeling. One of the few cuts in the reef in this area, there's a brilliant white sand floor between the two sides of the reef breaking with 6 foot crashing waves. Anchoring our new dinghy just behind the crashing surf was a bit like riding a bucking bronco, which maybe should have given us a clue about snorkeling conditions! Over the side into the cut, we swam out the cut - unfortunately altho' the scenery was beautiful, it was a bit beyond our current freediving depth. When we turned to swim back it was a bit like swimming in one of those swim in place exercise spas -- for every few feet forward, the current shoved us twice as far out the pass -- YIKES! We soon figured out to kick like crazy surfing in on a crashing wave, then kicking even harder to hold ground while waiting on the next wave. After this adventure, we both decided we'd had enough of swimming in the cut & started fishing behind the reef. Spearfishing turns out to be spectacular too, although poor David tried to drown himself just to get a fish! After snorkeling, I returned to the dinghy to put my camera away when I saw David a short distance away doing a very strange "duck & bob" dance in the swells. Turns out he has a really nice grouper (read: almost our favorite dinner...) on his spear, but the fish swam down into a coral hole slightly deeper than David's spear line. Being absolutely unwilling to drop the speargun, he was being pulled under each big swell! I swam a rope over, attached it & held the gun while he freedove to get the fish & spear. The fish had other ideas & wiggled off the spear attempting to swim away. I've never seen David reload so fast! Another shot & the grouper was his!!! Dinner was coconut cajun grouper fingers and was far better than any restaurant meal! Since the last update, Winterlude has been on the move! We left French Cay Harbor on Friday, March 17 to sail to Utila where our friends on s/v Kristiana & s/v Lonestar Love were anchored planning to head to Puerto Escondido, mainland Honduras on Saturday morning. We upped anchor at 6 AM and before 7 AM, LoneStar Love reported the first trolling catch of the day -- a BIG 24" tuna & invited us all over for fresh tuna that night. The following morning at 5 AM, the three boats departed Puerto Escondido for the 58 mile sail through the reef cut at Ranguana Caye, Belize to Placencia, Belize. First Edible Trolling FIsh ... Spanish Mackerel! Yum! We were safely anchored in Placencia by 2:30 PM AFTER catching first a BIG barracuda (no he did NOT get our fishing lure this time!) and then a 21" Spanish Mackerel! Obviously, the barracuda was not edible, but the Spanish Mackerel was not only edible but delicious! Now, think about the logistics of all this for a minute. Winterlude carries an offshore trolling rod in a rodholder on the stern. "Bo" the Monitor Windvane is driving & we're flying along over 6 knots when ZIINNNNGGGGGG goes the rod! David scrambles for the rod while I release Bo & turn the boat into the wind to slow down slightly. After quite a struggle, David reels in the fish, which neither of us have ever seen before. "Bo" is re-engaged while I run below for the fish ID book, leaving David holding a 21" wriggling, writhing silver fish by the leader over the back. Is it edible? Do we throw it back? NO, it ID's positively as a Spanish Mackerel -- aqua blue iridescent top, silvery sides, yellow spots & barbs behind his top fin to the tail. I love it when an actual fish matches the photo in the book! :) OK, so it IS edible, NOW WHAT??? We don't need a writhing bleeding fish flopping all over our cockpit -- can you see it? Dancing around the cockpit to avoid the flopping fish while trying to make sure the boat stays semi on course so we don't sail into coral heads??? Thinking quickly, we bring up the Igloo cooler that we were planning to sell at the swap meet in the river, throw the fish in the cooler & slam the lid! Later, when sailing's back under control & we're not trying to sail around coral heads, we treat the fish to a shot of vodka in it's gill -- this kills them instantly & to our minds is a much better way to go than a hammer shot to the head! Unfortunately the only vodka on the boat was Absolut, so this fish got a REAL treat -- you're supposed to stock rock-gut vodka to kill fish, but Winterlude has never caught enough fish to justify buying the bottle of rock-gut vodka! Our luck may be changing though! WL Checking in Big Creek... Big Ship Port! 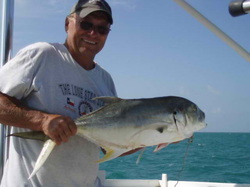 Monday morning bright & early, we checked in to Belize & then sailed to Sapodilla Lagoon, 15 miles to the north - no bites on the trolling hook that day! Tuesday we sailed to Garbutt Cayes & then Wednesday to Glory Cut where the update begins & we enjoyed our coconut cajun grouper fingers. Checking into Belize at Big Creek, Winterlude & the banana boats!